The hearScope works with a mobile app to provide real-time diagnosis. hearX, a Pretoria-based start-up, has designed an otoscope which uses an app and artificial intelligence to offer ear diagnoses in real time. The company claims the 'hearScope' is the world's first smartphone diagnostic otoscope. The company says the hearScope was designed to offer more accessible ear-health diagnosis, targeting audiologists, general practitioners, nurses and laypersons. 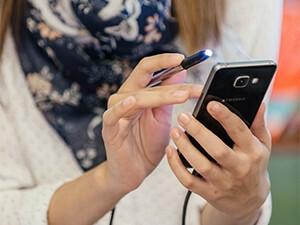 Users, who own the device, will be able to download its app, and connect the otoscope to their smartphones using a mini USB port, then use the device to take images or videos of their ear canal and ear drum. The app will then process the images for real-time analysis which could lead to a more accurate diagnosis, says hearX. The company hopes to make ear testing more accessible, especially to people in third world countries and emerging markets by offering "affordable access to screening or testing solutions and linkage to hearing health", says CEO Nic Klopper. It was registered in 2015 as a designer, maker and supplier of ear testing solutions. Founders and University of Pretoria lecturers Professor De Wet Swanepoel and Dr Herman Myburgh say they had a vision to enable more accessible ear-health diagnoses. The company says its products have been used on approximately 70 000 people in over 25 countries. "Our aim is to have a positive impact on an individual, community and global level by creating sustainable, smart solutions for hearing health for everyone," explains Klopper. "Researchers are currently working on our neural network for the automated diagnostic of the images, a feature which should be commercially available early 2018. By using artificial intelligence, an accurate diagnosis can be provided right to the smartphone in your hand," he adds. The hearScope is the company's fifth product and was recently recognised at the MTN Business Machine2Machine conference held at the Sandton Convention Centre. It was seen as having the potential to revolutionise access to hearing healthcare by turning a smartphone into an assistive diagnostic device, with the use of a lightweight piece of hardware. MTN says its support for such initiatives is not new. "We are supporting initiatives that develop solution offerings in a variety of industry sectors such as agriculture, wildlife conservation, transport, logistics, insurance, mining and retail to name a few," says Mariana Kruger, GM of ICT and converged solutions at MTN Business. "Through raising awareness of both problems and solutions, we bring home the reality that the future is actually here right now and everybody can benefit," she adds. The hearScope will launch locally on 1 August, via a crowdfunding campaign on IndieGoGo. The company is showcasing the device today at the Africa Health Exhibition and Conference.